UPDATE: Duchess Adams was found in 2014. Tina is still missing. 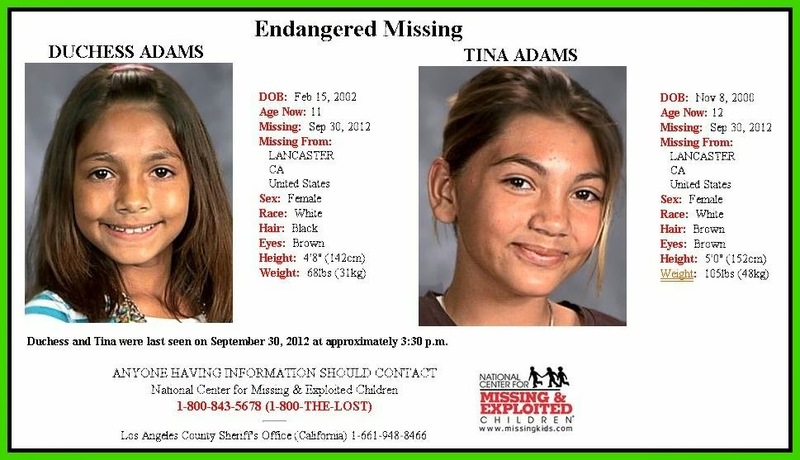 Original story: Duchess Savanah Adams, 11, and her sister Tina Adams, 12, went missing from Lancaster, Calif. on Sept. 30, 2012. They were last seen by their foster mother at the Vollarta Supermarket on the 1800 block of west Avenue. The girls told their foster mother they had left something in the store. They went inside but never returned. They have not been seen since. Later it was found the Duchess and Tina planned to runaway from their foster home to live with their older half-sister in LA. They never showed up there. There is a possibility they may be with their father Anthony Ristick who is known to be homeless. Ristick is a (Romani) gypsy family name in Portland Or. Years ago, a Ristick was named the King of the Gypsy’s and when he died there was a huge funeral for him. The girls are part of a family that lives a nomadic lifestyle, according to detectives. The girls’ father, Anthony Ristick, is considered a “person of interest” by detectives. Detectives have been unable to identify and locate the half-sister, but detectives have been in contact with the girls’ biological mother, who lives in Colorado. Prior to placement in the foster home, the girls had been in the care of their biological father whose last known address was in Oregon, but his current whereabouts are unknown. Pricilla Ristick was abducted in 2011. Read story here. If you have any information, please call the LA County Sheriff’s Office at 661-948-8466.